Today was "Third Friday" in the world of Wisconsin public education. That's the day that DPI uses as the cut-off to determine school's and district's enrollment for monetary purposes. It's a very, very big red-letter day for any school and district in Wisconsin, but it always takes particular importance in Milwaukee because it's the day that MPS schools find out if they are under or overenrolled and teachers move buildings. In MPS, Third Friday is a very, very big deal. But today it was a major deal, because over 100 schools in MPS staged Walk-Ins as a response to the takeover plan that was included in the biennium budget. Those walk in's were covered all over the Milwaukee media. "This is an attack on our democratic institutions," North Division social studies teacher Lukas Wierer told about 30 demonstrators gathered outside the building before the start of classes on Friday. Wierer acknowledged the Milwaukee Public School District's shortcomings, saying administrators and staff must "continue to strive to be better." But he said MPS is the "only institution in this city with the capacity, commitment and legal obligation to serve all of our students." Although this story does include a very befuddling dissenting stance from a woman who says, "I don't agree with political activism on campuses." Gee, too bad all that school integration stuff happened back in the day, right? The Fox 6 print story also includes a peculiar statement from takeover arcitech Sen. Alberta Darling, where she continues to repeat claims about "miracles" in New Orleans and Memphis while subsequently saying that parents and teachers want to trap kids instead of recognizing that we are fighting to give them what they deserve where they already are at. And even in La Crosse, as all of the schools in La Crosse joined in what is nothing short of a spectacular moment of solidarity across Wisconsin. State Sen. Kathleen Vinehout joked to me in December 2013 that "there is a big trench by Portage that all the news from this side of the state just falls into." Well, clearly, that wasn't the case today. La Crosse is SPOT ON. But that was only part of the day. The other part was spent downtown where the County Board's Intergovernmental Relations Committee passed by 4-1 vote a resolution opposing the MPS Takeover. The measure passed 4-1, with Supervisor Deanna Alexander as the lone dissenter and Tony Staskunas absent. It was proposed by County Supervisors Jason Haas, Khalif Rainey, John Weishan Jr. and Eddie Cullen. The resolution is essentially symbolic, as the takeover measure is now law. But it draws a line in the sand between County Board members and Abele, and seeks to ensure that costs associated with operation of the so-called Opportunity Schools and Partnership Program do not fall to Milwaukee County taxpayers, who already pay separate taxes for their schools. "When he (Abele) says no county employees will be used, we don't believe him," Weishan said. He said the takeover measure was " undemocratic and has huge future costs for Milwaukee County." Alexander, an Abele supporter, suggested the opposition was motivated " by politics and money." Sure, job security can be called money... I mean honestly, who doesn't want to fight for their job? But really, this is about equal access towards educational opportunities in Milwaukee, and independent charter schools do not give that. It's just that simple. Abele was in Washington, D.C., and did not attend the meeting. His administration director, Tieg Whaley-Smith, read a prepared statement reiterating many of Abele's prior statements regarding the takeover, including the assertion that he never sought oversight of the schools "and frankly shares some of the same concerns of those who have expressed opposition." "Now that he has this authority, however," Whaley-Smith said, "he is taking the responsibility seriously and is committed to making sure this effort is a success." THEN WHY SPEAK ABOUT IT AT ALL?! Like I have pointed out before, if Abele really doesn't want to hurt MPS and truly believes what he's saying, he should shut up and ask for help about how to avoid any damage to MPS. But based on his statements and just general lack of any specifics, he clearly hasn't the faintest idea about the power he wields and how some actions he seems to want to take very well could be putting the death nail into public education in Milwaukee. What's an even scarier thought is that he might know exactly what he's doing and is attempting to play us all for fools. Maybe he wants to see MPS get blown up, just like he seems to want to see so many county services be blown up and shipped out to the private sector. Then again, maybe there's a reason why State Sen. Chris Larson will be announcing his bid for Co. Executive in short order. "MPS teachers do the hardest job of any teacher in the state, and they do it better than anybody else, the challenges that we face in the classroom every day would baffle most people, yet we do it, and we do it successfully, the bad things get put on the news the great things tend to be ignored,” said Kim Schroeder, MTEA President. 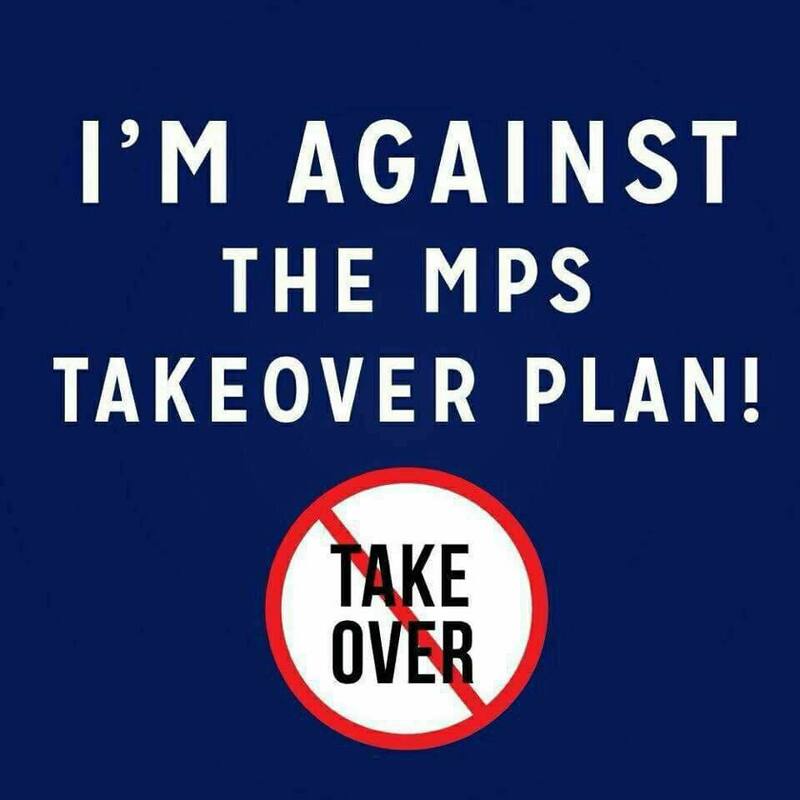 If you're looking for more information and pictures from all across MPS where schools walked in, I suggest looking on the Stop The MPS Takeover Facebook page or you can also head over to the MTEA website which has lots of images as well. And in case you were wondering, you'd better believe I took part in a walk at my school, and was the one who happily organized and distributed flyers to staff after school.